Putney Under Sea In 2100? 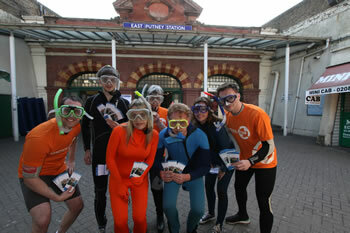 Commuters dressed in diving gear have highlighted the impact of a predicted rise in sea levels in Putney to mark Climate Change Week. According to a report to the London Assembly, sea levels could rise by four metres by 2100. Such an increase would leave East Putney Station underwater, along with dozens of other London Underground stations. Office workers dressed in snorkels, masks and fins from development charity Practical Action will be raising awareness of the impact of an increase in sea levels to people living in London, and in Bangladesh. “Rising sea levels will result in Putney tube station disappearing in less than 100 years. Our event will help people highlight green issues in the UK and how they impact on international development and we have invited Putney MP Justine Greening to come along and see how important these issues are to her constituents. In addition to East Putney, other west London tube stations which would be swamped by rising sea levels include Putney Bridge, Parsons Green, Gunnersbury and Kew Gardens. Elsewhere, iconic stations including Westminster, Embankment, London Bridge and Canary Wharf would also be submerged by a four metre rise. “One of the most effective ways for people to campaign on climate change is to get active locally. MPs need to hear that their voters care about climate change if they are to push for the strongest action to address climate change.